CSS has a hsl() function that is used to define colors in the HSL format which stands for Hue, Saturation and Lightness. All these three values can be set in the hsl() function in their respective order. 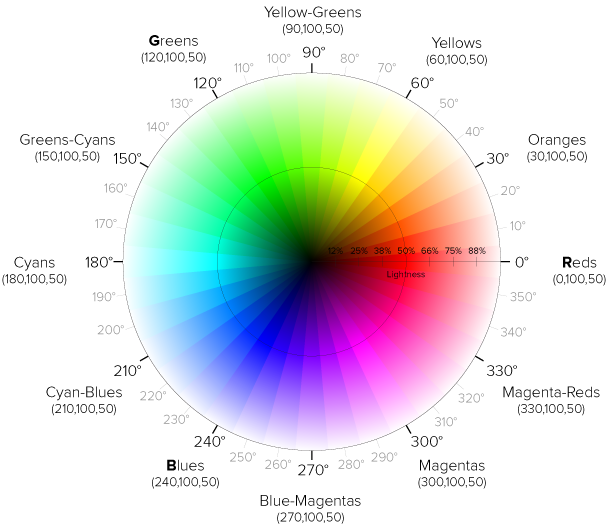 The hue component of HSL specifies the angle (degrees) in the color wheel. HSL Color Wheel by Erin Sowards. Blue has a hue of 240°. We define a full saturated and normal lightness red color for the background in the :root selector which corresponds to the <html> element. What I like most about HSL is that by remembering the 120, 240, 360 values for green, blue and red you can easily define a range of beautiful colors by playing with the saturation and lightness percentages. What About HSLA (Hue, Saturation, Lightness, Alpha)?